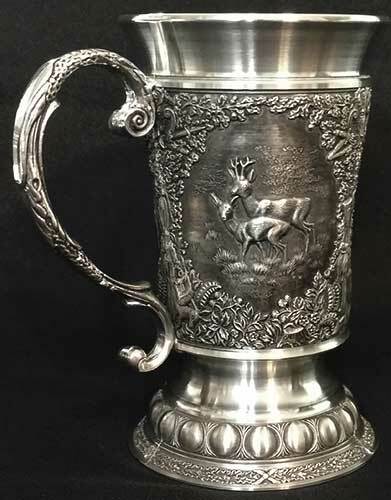 Pewter tankard features Irish stag imagery on three embossed panels. This Celtic tankard is hand-made from lead free pewter. 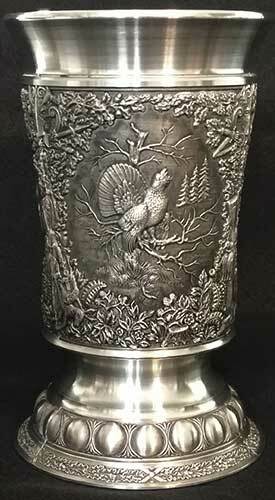 This Irish tankard features pewter construction that depicts the following embossed woodlands scenes on three panels: a stag, a stag and a doe, and a pheasant. 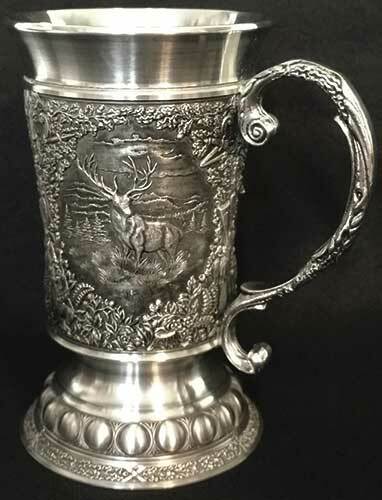 The Stag tankard measures 3 1/4" wide at the rim x 5 1/4" tall; it holds 16 ounces. The deer tankard is made in Ireland by Mullingar Pewter and it is gift boxed, complements of The Irish Gift House. Pewter tankard features Irish fox imagery on three embossed panels. Pewter tankard features Irish duck imagery on three embossed panels. Pewter tankard features Irish hare imagery on three embossed panels. Pewter decanter features the woodlands motif and would be ideal for wine or as a water carafe. Irish goblet features pewter construction that is enhanced with embossed panels depicting a stag, along with a fox and ducks.